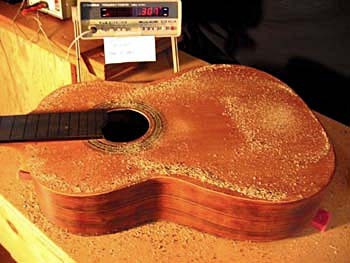 Guitars, like other musical instruments, display several distinct resonances that are important determinants in the sound of the instrument. These resonances occur at a range of frequencies and, interestingly, have unique shapes that usually appear in a predictable pattern as one progresses from low to high frequency (or low to high notes, to use musical terminology). 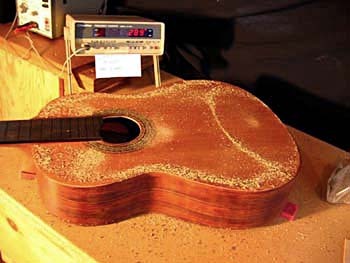 The behavior of the resonances is complex and is not especially well understood by physicists, particularly in regard to the question of what makes a great guitar. Nevertheless, I have found resonances to be a very useful tool for improving and giving consistency to my instruments. Dealing with wolf notes, dead notes, and issues such as balance, power, and timbre, plus many others, are all made much easier with a knowledge of resonances. 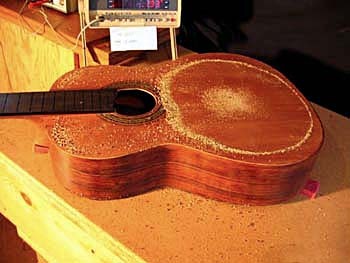 For centuries luthiers have tapped wood with their knuckles to learn the pitch (or frequency) of the resonances involved, and that method, involving hands and ears and musical judgment, is unlikely to ever be replaced. However, it is also very helpful if the builder can see the shape of a resonance as well as hear it, and for that other methods are available. 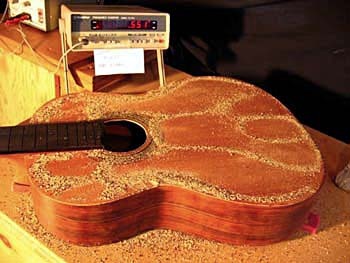 Physicists use holography and other sophisticated techniques to see the resonances, but in the working guitar shop, a simple and very effective method is the creation of resonance patterns using a sound generator, a speaker, and tea leaves. These resonance patterns or modes are often called Chladni patterns, named for the German physicist, Ernst Chladni, who first developed the technique in the nineteenth century. Here is the equipment I use in my shop to create Chladni patterns. Only the tea leaves are missing! The tea leaves vibrate to non-moving areas of the top (called nodes). This is the fundamental resonance of a recent guitar, and its frequency shows on the counter. 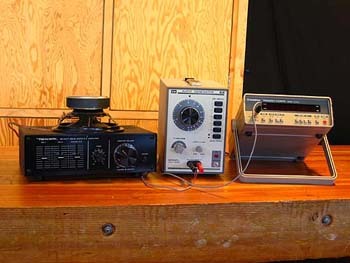 At 193 hertz (cycles per second) it is very close to the frequency of G3. 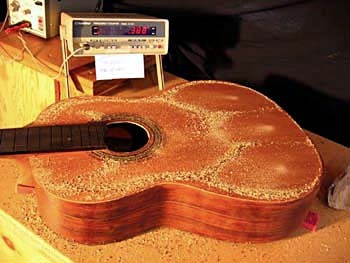 Here are a few other resonances of the same guitar. You can see how the patterns change as the frequency rises. This is 270 hertz. So what . . . ? So how do the resonances, as heard with a tap of a knuckle or seen in a Chladni pattern, relate to the musical qualities of the instrument? 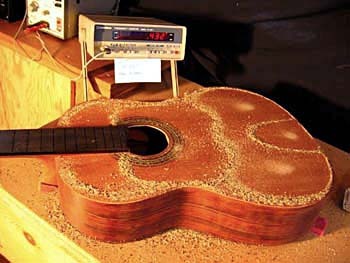 At a resonance a guitar is vibrating very efficiently, which means that the notes whose frequencies are near that resonance are strong and easy to produce. When you play along the strings on most guitars, you notice that some notes are slightly louder, with a faster attack and better definition. These notes are being supported by a resonance. Conversely, the notes that are quiet and sluggish (or even dead) probably don’t have a resonance nearby to help them. 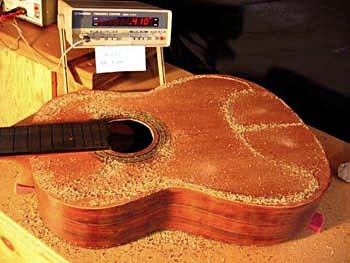 In order to achieve balance and evenness, the luthier’s task is to disperse the resonances so that they can support notes everywhere on the fingerboard, from the lowest bass notes all the way up to the highest frets on the 1st string. 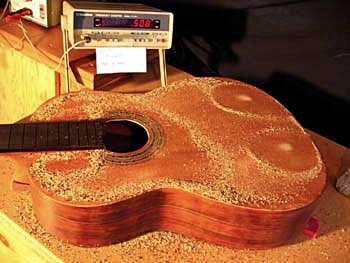 If the goal is to have a stronger treble, then the luthier tries to have more and/or stronger resonances occur at higher frequencies. And if a more powerful bass is the objective, then the resonances at lower frequencies are emphasized. 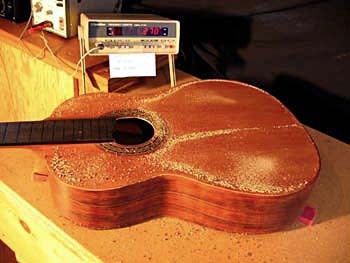 Part of the challenge for the luthier is to locate the frequencies of the resonances close to those of the notes to be supported, but not at exactly the same pitch. Wolf notes are examples of notes that are supported too closely by a resonance. At the particular pitch of the wolf note, the resonance is allowing the guitar to work so easily that the sound is loud and honky. The solution is to move the resonance away from the note; sometimes a distance of only a few hertz is adequate. The fundamental resonances of the tops of the Hauser guitars that I have examined range from F# (185 hertz) to G (196 hertz). It is my understanding that Segovia’s famous Hauser (which I have not examined) also has a top resonance near G, and for many years I have taken this as a target for my own work. Segovia’s Hauser also apparently has a back resonance near A (220 hertz), which corresponds with my own research on other Hauser instruments, and which I use as a target resonance for the back. Initially, of course, I used these targets on traditionally-built, solid top instruments. Now I use them to give my double-top guitars the familiar, beautiful classical guitar tonality. In the future I hope to enlarge this discussion of resonances, but because the topic is probably of interest only to builders and technically-minded players, I plan to put it in a separate section of my website. I welcome correspondence from both players and builders about the subject. 좋은 자료 잘 봤습니다. 감사합니다.